Left to right: Bernard Wehring, Ayman Hawari, Arka Datta, Igor Bolotnov, and Paul Huffman. 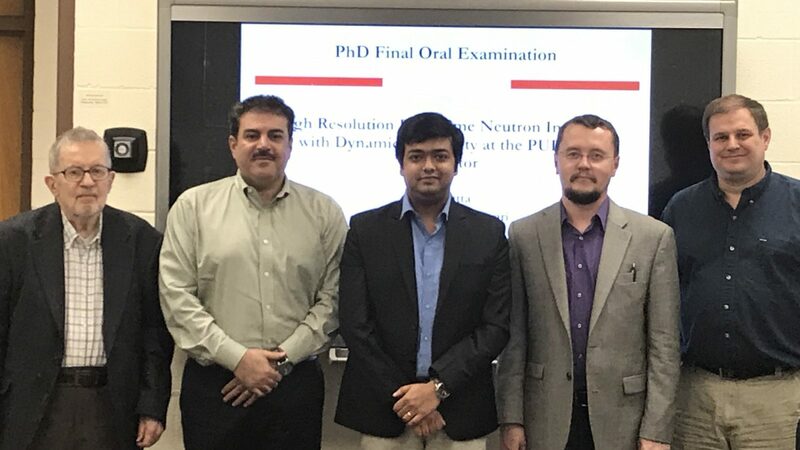 On March 15, Arka Datta successfully defended his PhD dissertation, High Resolution Real-Time Neutron Imaging with Dynamic Capability at the PULSTAR Reactor. Arka’s committee consisted of his advisor, Ayman Hawari, and members, Bernard Wehring, Igor Bolotnov, and Paul Huffman. Datta, Arka. High Resolution Real-Time Neutron Imaging with Dynamic Capability at the PULSTAR Reactor. (Under the direction of Dr. Ayman Hawari). In the present work, a high resolution real time neutron imaging system is developed. The system was characterized and optimized for utilization of static neutron radiography, tomography and for dynamic neutron radiography. Complementary attenuation characteristics with X-ray, make neutron imaging a useful non- invasive investigation modality for a wide range of applications in science and engineering. Advancement in electronic imaging systems makes it possible to obtain neutron radiographs in real-time. The components of the real time neutron imaging system include a neutron source, a collimator, and a detector which includes a scintillator, a lens and a camera. Real time neutron imaging was performed using a 6LiF:ZnS(Ag) scintillator to convert neutrons to optical photons and a Charge Coupled Device (CCD) camera to detect those photons. These components of the real time neutron imaging system have been explored and the resolution contribution has been quantified. A multi-physics Monte-Carlo simulation model was developed to investigate the performance of the thermal neutron imaging system. It has been observed that the resolution contribution of the scintillator screen is correlated to its thickness and the range of the neutron absorption (in lithium) reaction products (i.e., the alpha and triton particles). The results of the simulation were compared to experimental measurements performed at the neutron imaging facility of PULSTAR research reactor of North Carolina State University (NCSU), showing good agreement. The achievable spatial resolution with the developed radiography system was 81 ± 2 µm with 50 µm thick scintillator screen. To explore and expand the capability of the imaging system, a high resolution computed tomography system was developed and characterized. The developed Monte-Carlo Multiphysics simulation model was extended to investigate the performance of the computed tomography (CT) system. The projection data were obtained by simulating various scintillator thickness at two positions from the beam aperture, yielding L/D ratio as 73 and 142. Analytical and iterative reconstruction algorithms were implemented and characterized for the CT reconstruction. The best performance was obtained with largest L/D ratio and a thinner scintillator as expected. Further, a model based CT reconstruction technique was developed and implemented to improve the spatial resolution of the reconstructed images. The quantified system response function was included in the forward projection model to provide a better estimation of the actual projection, thus improving the spatial resolution of the reconstructed images. Experiments were performed at the neutron imaging facility of the PULSTAR research reactor to corroborate the performance of the developed model-based algorithm. The spatial resolution for tomography with the model based technique was 87 ± 3 µm with 50 µm thick scintillator screen, showing an improvement of nearly 40% in achievable spatial resolution as compared to traditional techniques. In addition, to illustrate the capability of imaging dynamic phenomenon, especially the observation of bubbles in fluids, micro-bubbles were generated and imaged at high resolution. Bubbles of 1300 µm diameter were generated by injecting through 50 µm orifice to demonstrate the feasibility of such dynamic investigation. The imaging system was characterized with two lens magnification settings and two different positions at the beamline yielding L/D 73 and 142 with 50 µm and 250 µm thick scintillator. The performance of the neutron imaging system was optimized with spatial resolution, temporal resolution, and SNR, showing the generated micro-bubbles with a spatial resolution of 245 ± 5 µm and a temporal resolution of 50 ms. Additionally, the individual bubbles were identified and segmented to characterize the size distribution of the bubbles.